Hello world! I’m coming back up to the surface after over a year of silence on this blog. As always, I have things about technology and my work to rant about… but I’d like to first make a (public) review of what’s happened in all this time. This will be a smorgasbord of professional and personal happenings, probably too strangely interwoven to be of interest to anyone in particular. I feel nevertheless I should get some words out on this blog, and update the, ahem, public record. Just about the time of my last post in March 2015, the Stanford NLP Group went on its first lab retreat in a long time to Point Reyes. The lead picture of this post shows a beautiful section of the Pacific Coast Highway I captured on the way north. At this lab retreat I spoke with Sam Bowman and Kelvin Gu about end-to-end systems for deep learning for NLP. Inspired by a recent debate between Andrew Ng and Christopher Manning, I tried to argue an aggressive (though not original) thesis about our long-term approach to language understanding systems. My claim, which now sounds rather stale in 2016, was that we should drop tasks like parsing and part-of-speech tagging. Natural language processing should solve language understanding tasks that non-experts actually care about. In short, we should focus on “end-to-end” systems where the output is something of interest to real people. The counter to that argument (then and still now) is that intermediate representations like constituency parses actually work to produce useful results downstream. They help us practically reason about extremely complicated linguistic patterns. I can point at a parse or a part-of-speech tag and recognize that it tells me something meaningful about a piece of language. Building deep-learning systems that learn to model such complexity, while theoretically feasible, is pretty darn hard. But “pretty darn hard” had never stopped any of us before. We started to discuss ways to simplify the end-to-end learning problem by adding structure (less constraining than the structure of a parse) to the computation problem. That discussion was the basis for our recently published SPINN model. More on that later. I spent my summer as a research intern at Google Brain, co-advised by Ilya Sutskever and Oriol Vinyals.2 The Brain team was an outstanding place for young aspiring researchers like myself. Around 15 interns came to work with the motivated and creative members of the team, using some seriously beefy Google infrastructure to attack challenging problems in machine learning. As a first non-work-related note, it’s certainly worth mentioning that I discovered a new road biking obsession that summer. 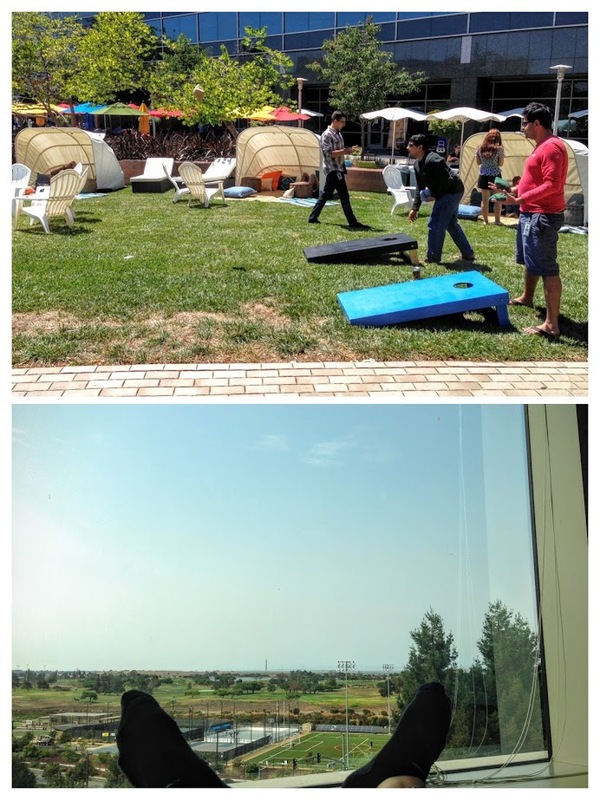 I joined up with a team of Googlers riding Waves to Wine and trained with them for the whole summer. 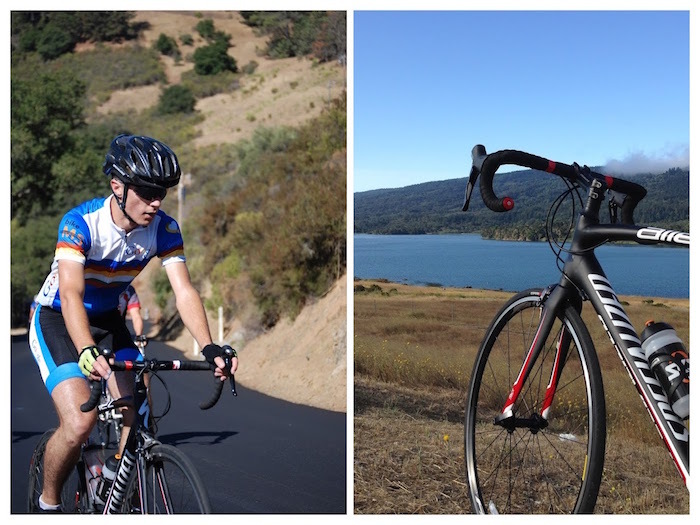 I learned to climb mountains and speed down descents, leveling up from newbie-cyclist to slightly-less-newbie cyclist. Cycling was a great release for me. While I loved working on the Brain team, I found the work environment on the Google campus rather stifling. It’s truly a paradise in Mountain View, for better and for worse. With a road bike I was able to escape that sprawling land of perfection and explore everywhere from China Camp in the North Bay to Santa Cruz on the opposite end. I kept biking when I got back to Stanford in the fall. It’s become a reliable way for me to escape the messy, mathy world of artificial intelligence. 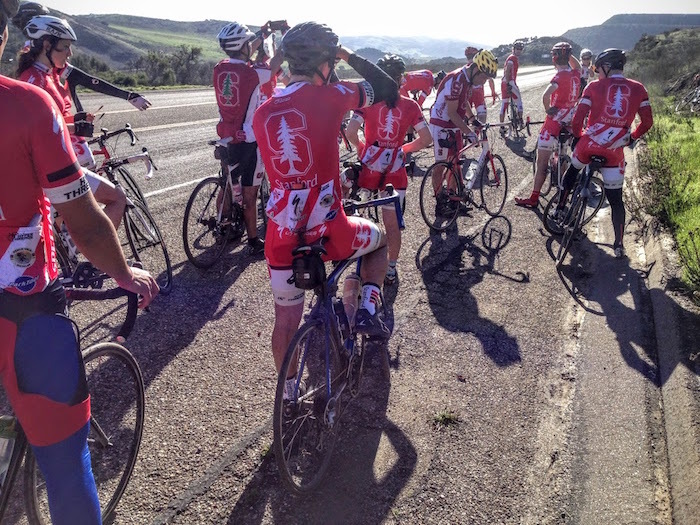 The Stanford cycling community is very supportive of motivated beginners, and I was able to level up again with some very impressive skilled riders. 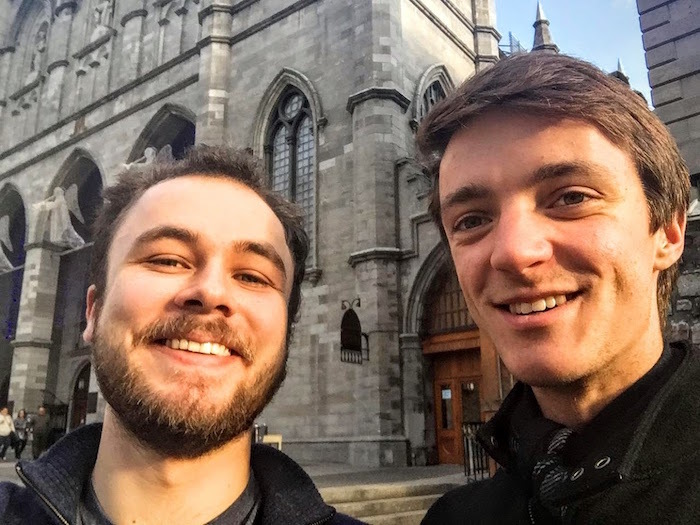 In the fall, Sam and I started working seriously on what would later be called SPINN (the Stack-augmented Parser-Interpreter Neural Network). The idea began as a very simple one — we wanted to exploit a stack as a structured memory model for end-to-end deep learning for NLP tasks, possibly using existing linguistic data to guide exactly how the stack was used. We saw this approach3 as a first step toward a totally parse-free, fully-differentiable end-to-end system. We designed a model that would follow a shift-reduce parse sequence (generated from a gold constituency parse) and build vector representations of the parse nodes along the way. At some point in front of a whiteboard, Sam realized that this model computed exactly the same function as a recursive neural network.4 That was when we knew we were onto something interesting. Sam ran some preliminary experiments on toy data and the results suggested we should move forward. Near the end of the year, Abhinav Rastogi and Raghav Gupta, two masters students, joined us on the project. With double the manpower, we charged ahead and sicced various evolved forms of the model on Sam’s baby, the Stanford Natural Language Inference dataset. We wrote the whole thing in Theano, and ended up having some serious problems with training runtime performance. Months of toil in code optimization, Theano-hacking, and writing CUDA code taught us a good lesson: if you’re doing anything remotely unusual in terms of neural network structure, you probably should ditch abstractions like Theano and work down at the layer of the metal. I escaped Stanford for a bit in the winter to attend NIPS 2015. This was my my first machine learning conference, and I really enjoyed socializing and participating in casual brain-storm sessions with people from across the world. The conference itself was pretty exhausting — there were way, way too many people, and we all had to squeeze into a single gigantic conference room for a single-track oral presentation schedule. In any case, it was nice to slip out of California for a while and revive my seriously broken French in Montréal. After a comfortable holiday break at home with the family, I returned to the bike heaven / ridiculous economic bubble / home of an artificial intelligence renaissance that is the San Francisco Bay Area. 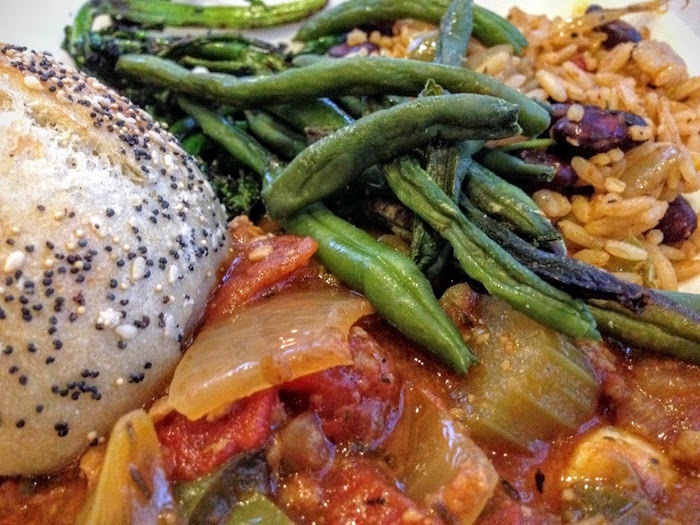 I made a big life decision that had been sitting around in the queue for a while and became a vegetarian. This isn’t the place for me to wage an anti-meat campaign — interested readers can just take a good look at e.g. the report of the Pew Commission on Industrial Farm Animal Production to see why this might be a reasonable thing to do.5 I had seen these reports and become acquainted with the facts long before 2016. But, like many people, I had settled to live with the cognitive dissonance of at once enjoying meat and knowing that it was a harmful and ethically wrong habit. That changed after I read Jonathan Safran Foer’s Eating Animals. Jonathan’s situation was much the same: before writing his book, he was a meat eater with a guilty conscience who had made several failed attempts at vegetarianism. While I was already familiar with the high-level facts of the modern meat industry, Jonathan’s personal story motivated me even further — enough to actually move forward and make the change. The SPINN team — now six strong, including our advisors — toiled throughout the winter to develop the model theory and evaluate it on natural language data. When not outside on a bike saddle, I spent the season cooped up in my office in the Gates building, writing code, reading relevant papers, and hoping for success. It slowly became clear during the quarter that things were going to work out in our favor. We submitted a report of our work to the Association for Computational Linguistics in March, and will present it at the conference this summer. And then I was off to Berlin! I had long ago applied to the Stanford overseas study program in Berlin. After several years of mostly tunnel-vision intellectual focus on artificial intelligence, I knew that my brain needed some novel content in order to keep functioning. I wanted to return to my dormant love of language learning. I had obsessively taught myself languages during high school, but mostly dropped the activity at university, where time for leisure-learning was rather scarce. 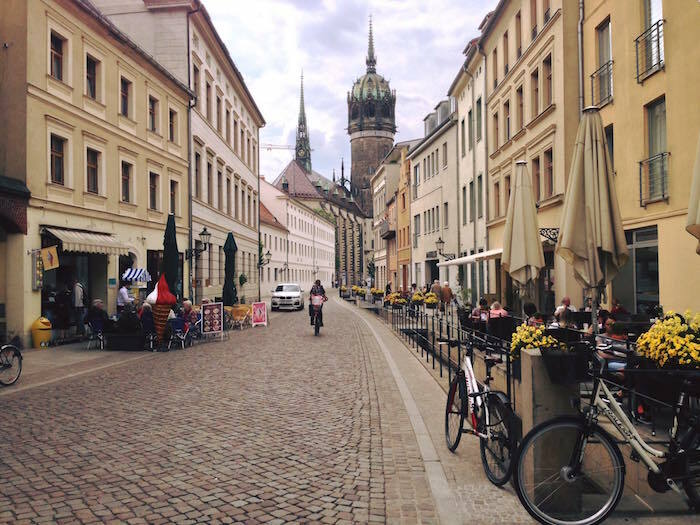 A language-immersion trip to Germany was a perfect way to slip back into the old hobby — and, no less important, to slip out of the fast-paced world of AI research for a short while. A generous and welcoming family hosted me in the peaceful city quarter of Friedenau. 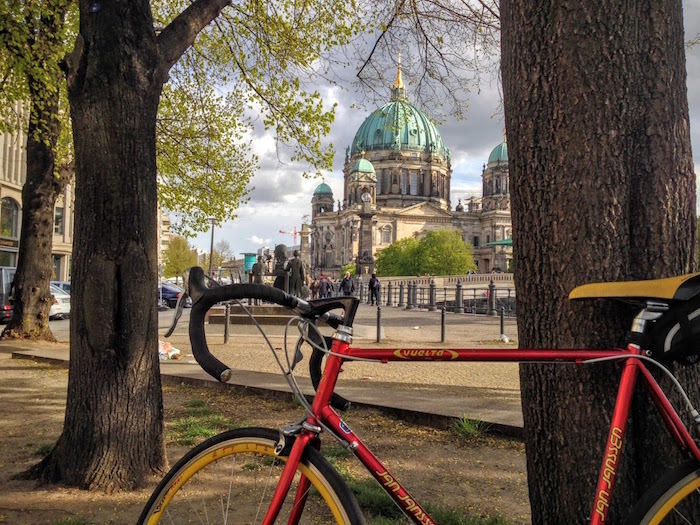 I studied German at a Stanford satellite in Berlin and spent my free time exploring the city and cycling, sometimes with the Freie Universität Berlin riding group. The immersion experience was a wonderful challenge, though I probably wouldn’t have chosen the adjective “wonderful” as I was going through it. I learned (the hard way!) to trust myself to speak fluently in another language — to be willing to make some mistakes and fail in front of other people, that is, in order to convey what I want to say. This was a fully intellectually engaging task. I found every day quickly filled up with conversations, literature, television, and movies, and everything that might have been banal or boring in English was an important and interesting part of my studies in Berlin. Of course, there is more to Berlin than the German language. The city has a dark and complex past, and the modern Berlin, no longer physically divided, still shows scars of its turbulent history. Exploring this history in person — through conversation and travel — added a new dimension to formerly dry textbook knowledge in my mind. It’s a happy coincidence that this year’s ACL conference takes place in Berlin in a few months. I have an excuse, then, to go back and ensure that my German hasn’t rusted! But for now, I’m off to San Francisco for what is sure to be an exciting summer. I’m joining the rapidly growing reseach team at OpenAI, which has managed to already release a swathe of papers on generative models and a platform for open reinforcement learning research. I believe I’m expected to add some linguistic nuance and NLP fun to the mix. We’ll see what I come up with. Well, I’ve reached the present day, so this brings my whirlwind review of over a year to a close. I certainly wouldn’t have managed to make this progress without the support of my family and friends. With thanks to them and to my readers, I’ll end the review here. Until next time.